Found her. She’s on this poster! Alice Creed’s abduction was no rash act of random impulse. A LOT of pre-planning and preparation went into the operation which was performed with precision and seemingly went off without a hitch. But it didn’t end there. Once in “captivity” Alice (Gemm Arterton) is bagged, secured, stripped (dispassionately) tied down and sedated. As so much in this film revolves around not knowing I will not describe too much about the three main participants in the story. We already know the name of the captive, aside from her handle she is pretty average in many ways. Alice is in her 20s, was not taken for her beauty, and as far as we know is not especially “special” in any way. In fact for 10 or so minutes we are told nothing about much at all. The two kidnappers are both male; one is around 40 (Eddie Marsan), he appears to be running the show and the main driver of remaining professional and adhering to the master plan, the second (Martin Compston) is in his 20s and appears nervous, skittish and edgy. We learn Alice is to be ransomed for a large amount, and all going well the duo should be paid within 36 hours. Ms Lohan’s treatment was intensified. But a lot can happen in 36 hours, even to a perfect plan. Decisions are made. These Decisions lead to Actions being taken. These Actions have Consequences. Some of these Consequences create Complications. It is these Complications that lead to Repercussions. The film has a couple of twists and turns that are thankfully not foreshadowed, hence they are far more effective. 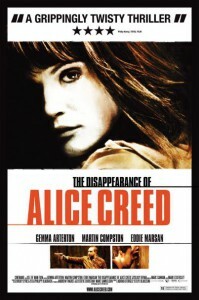 The film is smart but not smart-arse, and while realistically the complicated series of events that ensues over the period following Alice’s abduction is improbable that makes it no less interesting. As you can see it’s hard to explain much of the Disappearance of Ms Creed without tip-toeing around events and facts… so I won’t. What I will say is that this is a very effective low budget thriller, and that while it goes into dark territory at times it never veers off the rails or moves into silliness. The three leads (and only people in the film!) are all excellent and believable for the most part, and even with all the twists it is easy to follow the action. The fact that we never really know who will have the “happiest ending” (or maybe least sad) maintains the interest. Final Rating – 7.5 / 10. A nice little tightly wound thriller with excellent performances and a clever plot. It reminded me of Hard Candy but without the ickiness… Worth a look.